In October of 1911, a group of revolutionaries in southern China led a successful revolt against the Qing Dynasty, establishing in its place the Republic of China and ending the imperial system. In the Nineteenth Century, the Qing Empire faced a number of challenges to its rule, including a number of foreign incursions into Chinese territory. The two Opium Wars against Western powers led by Great Britain resulted in the loss of Hong Kong, forced opening of “treaty ports” for international trade, and large foreign “concessions” in major cities privileged with extraterritorial rule. After its loss in the Sino-Japanese War (1894–95), Imperial China was forced to relinquish control over still more of its territory, losing Taiwan and parts of Manchuria and ending its suzerainty over Korea. The Russo-Japanese War (1904–05) firmly established Japanese claims to the Northeast and further weakened Qing rule. 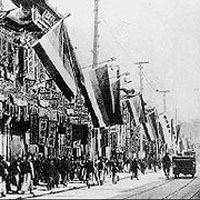 The combination of increasing imperialist demands (from both Japan and the West), frustration with the foreign Manchu Government embodied by the Qing court, and the desire to see a unified China less parochial in outlook fed a growing nationalism that spurred on revolutionary ideas. As Qing rule fell into decline, it made a few last-ditch efforts at constitutional reform. In 1905, the court abolished the examination system, which had limited political power to elites who passed elaborate exams on Chinese classics. Faced with increasing foreign challenges, it worked to modernize its military. With its central power weakening, the court also attempted a limited decentralization of power, creating elected assemblies and increasing provincial self-government. Although the Qing court maintained a degree of control within China in these years, millions of Chinese living overseas, especially in Southeast Asia and the Americas, began pressing for either widespread reform or outright revolution. Kang Youwei and Liang Qichao emerged as leaders of those proposing the creation of a constitutional monarchy. 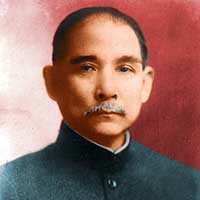 Sun Yat-sen led the amalgam of groups that together formed the Revolutionary Alliance or Tongmenghui. The Revolutionary Alliance advocated replacing Qing rule with a republican government; Sun himself was a nationalist with some socialist tendencies. Both the revolutionary leaders and the overseas Chinese bankrolling their efforts had their roots in southern China. 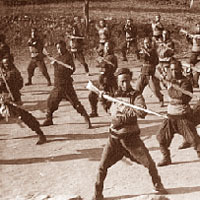 The Revolutionary Alliance attempted seven or more different revolts against the Qing in the years leading up to the revolution, most of which originated in south China and all of which were ultimately stopped by the Qing army. The 1911 revolution was only the first steps in a process that would require the 1949 revolution to complete. Though the new government created the Republic of China and established the seat of government in Nanjing, it failed to unify the country under its control. The Qing withdrawal led to a power vacuum in certain regions, resulting in the rise of warlords. These warlords often controlled their territories without acknowledging the nationalist government. Additionally, the reforms set in place by the new government were not nearly as sweeping as the revolutionary rhetoric had intended; unifying the country took precedent over fundamental changes. International reaction to the revolution was guarded. Foreign nations with investments in China remained neutral throughout the upheaval, though they were anxious to protect the treaty rights they gained from the Qing through the first and second opium wars. Still, the United States was largely supportive of the republican project, and in 1913, the United States was among the first countries to establish full diplomatic relations with the new Republic. Britain, Japan, and Russia soon followed.